Efrain Juarez has been granted a work permit ahead of the Mexico right-back's transfer from UNAM Pumas to Celtic for an undisclosed fee. The 22-year-old has agreed a four-year contract and Celtic say he will undergo a medical in Seattle while they finalise the necessary documentation. He had played three times for Mexico at the World Cup finals in South Africa. Now Juarez has joined his new team-mates in Seattle as the Glasgow side continue their tour of North America. And he is poised to become Neil Lennon's fifth summer signing after the arrival of defender Charlie Mulgrew from Aberdeen, midfielder Joe Ledley from Cardiff City, striker Daryl Murphy from Sunderland and South Korea right-back Cha Du-Ri from Freiburg. Juarez, who can also play in central midfield or on the wing, had returned to Pumas in 2008 after two years with Barcelona, where he played for the Spanish club's B team. He helped Pumas to fourth place in La Primera Division before heading for South Africa. Celtic manager Neil Lennon had said on Wednesday that he was confident of signing Juarez in time to make his Celtic debut against Manchester United on Friday. He missed out on the game in Toronto but has now joined the squad in the United States. 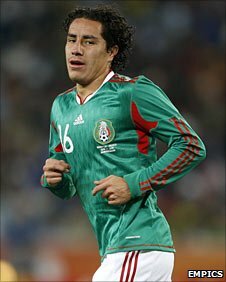 Juarez, who had also been linked with moves to England and Spain, helped the Mexicans reach the last 16 stage of the competition. "He's got great energy, is really comfortable on the ball and works really hard off the ball," said Lennon. "He's a very fit lad and I think his style will suit us. He's a hardy little guy as well - he can put his foot in. "I saw Juarez playing against England at Wembley before the World Cup and just kept an eye on him. "I thought he looked decent there and in the World Cup and, when the opportunity came up, we watched him again and again and asked if he would fit in to what we wanted to do here. "We all agreed that he would. We're not paying massive money for him."